Courthouse Square is (finally) reunited, so we can (finally) say our downtown has sort-of a park, although there’s so much parking on the sides it is much smaller than need be. But the important thing is Santa Rosa (finally) has a central place where citizens can gather together – something the town has sought since its founding in 1854. In the layout of the town 163 years ago it was called the Plaza, but I can’t recall seeing much evidence it was used for public gatherings except for a portion of the ceremonies for the 1876 Centennial. It was simply a small lot criss-crossed by footpaths and usually in pretty rough shape because no one took care of it. Its potential as a park was further limited when it was clearcut in 1884 to build a courthouse and after that one tumbled down in the Great Earthquake of 1906, the parcel was almost completely filled with the elephantine courthouse built to replace it. But having a nice public park was a Very Big Deal for our ancestors, and not just for sports and recreation; parks were the heart of 19th century communities. Having a pretty park came with considerable bragging rights – it was the yin to promoting a town paired with the yang of boasting about the burg’s economic prowess and promising future. So if you want to grasp the history of Santa Rosa understand this: The city fathers yearned to be a great Bay Area metropolis, and at the tippy-top of their wishlist was having a terrific park. At a minimum, Santa Rosa needed a place for political rallies, holiday celebrations, group picnics and the like. Except for the occasional circus or traveling theater group, these doings were about the only entertainment in a small town like this during the 19th century; if there was to be an Admission Day parade with marching band followed by a snoozefest speech about the Mexican War from Colonel I. Blather, Ret., you, sir or madam, would be in that audience along with hundreds of your neighbors – and glad for it. For about a dozen years around the 1870s, the destination was Arcadia Park, also known as “Willows.” (Its site was obliterated by Highway 101 but the current intersection of Morgan and Ninth street was near the southeast corner, with the northwest end being the corner of Davis and Tenth street on the west side of the freeway.) It was privately owned and available for rental, but apparently not open every day. Public use faded in the 1880s after it was bought by the Metzger family, who built a home on the property followed by a winery. But it also had other drawbacks which made it less than optimal. It was about a half-hour walk from downtown with no public transport (meaning horse-drawn trolley) and was apparently little more than a vacant lot with no amenities – although some newspaper descriptions mention a saloon, dance floor and a ten-pin bowling alley, these structures must have been quite small or temporary. 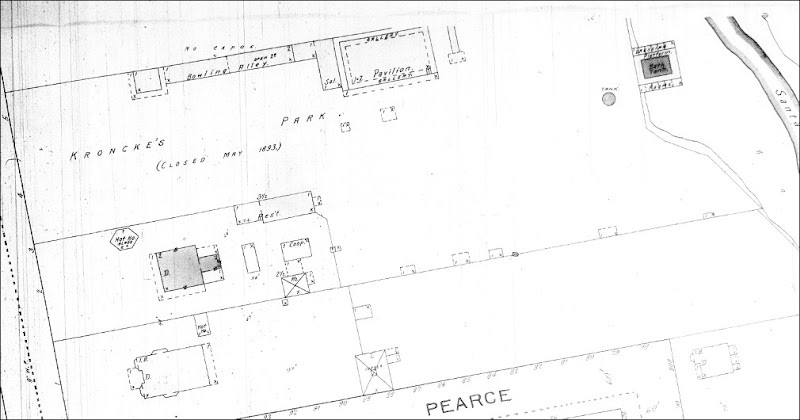 The whole place was only an acre, not much larger than the original plaza. That it was so well-used only shows how desperate Santa Rosa was. On the east side of town was another private park over twice as big and with much more to offer. It was closer to downtown and on the trolley line, where Fourth st. meets McDonald and College avenues (today it’s the Creekside Park apartment complex at 1130 4th street). “City Gardens” backed on to Santa Rosa Creek and had a tiny lake/pond, a zoo of some sort and a velocipede track where bike enthusiasts could race around “at a 2-40 gait” (about 22 MPH), according to an 1869 item. That place also had a special significance in Santa Rosa history, as it was around there where Julio Carrillo and his pals hosted a blowout Fourth of July picnic and ball in 1854 to convince county residents to vote for making Santa Rosa the county seat – although the town barely existed at the time. Spoiler alert: It worked. Never underestimate the power of free BBQ. At the same time Arcadia Park was fast fading away as the Metzger winery expanded. About the only events advertised at the park now were picnics for the German Social Club (of which William Metzger was a leader) and the annual Italian picnic. And that was another reason park use dwindled: The area around it had grown into being the Italian community which was shunned by the racist, pro-Confederacy society which dominated Santa Rosa – and would continue to do so for decades. City Gardens closed for a year and reopened under a new owner: Peter Henry Kroncke (that spelling is correct, but he was variously tagged in the newspapers as “Kronke,” “Kroncker,” and the grunty, “Kronk”). Henry Kroncke was well-established in town as owner of the Santa Rosa Planing Mill and was often mentioned for his partnerships with others in the lumber and construction trades. There is no dispute that he built a beautiful park and it looked like Santa Rosa at last had found its heart – or at least, a nice place for anyone who could afford the 25¢ admission, the equivalent of about six bucks today. That second ad also stated this: “Grand excursion from San Francisco.” From Kroncke’s agent in the city anyone could buy a round-trip ticket to Santa Rosa at the subsidized price of $1.00 – not including the park admission price, of course. Enough daytripping San Franciscans to pack fourteen train cars came to watch the sword fight, and those attendance numbers continued all summer, with apparently 1,000-1,500 coming to Santa Rosa each Sunday. Kroncke’s Park was clearly a smashing success for both itself and the town. There was one eensy little drawback: The big crowds attracted pickpockets. “That exception to the pleasures of the day is one that is attendant on all such occasions,” wrote the Sonoma Democrat. Uh, since these “occasions” were scheduled for every weekend, did that mean Santa Rosa should brace for a regular influx of wrong-doers? Why…yes. While still being an apologist and stating “it should not be inferred that all the excursions have been objectionable,” the paper reported police had to break up a free-for-all fight at the park and brawls continued throughout the afternoon. An officer clubbed a disorderly man unconscious on Fourth street. Worst of all, “when the train left for San Francisco in the evening about sixty ot the hoodlums got left, and put in the night parading the streets.” I’m sure that must have been a peaceful evening in old Santa Rosa. The worst incident came the following year, as an excursion coincided with the last day of the county fair. The “sallow-faced individuals dressed in chinchilla coats” and “their vulgar female companions [were] an outrage on all sense of decency” as they bullied their way around downtown, pushing people off the sidewalks and stealing booze and cigars from saloons. One of the crowd entered a hotel and grabbed the heavy bell used to announce dinner service and hit the hotel owner in the head with it, knocking him cold. A Deputy Sheriff and two off-duty San Francisco policemen arrested the man on the returning train, but only after a confrontation with the guy’s pals who were trying to hide him from the cops. Yet the newspapers – particularly the Republican – continued holding Kroncke’s Park and its excursion train promotion blameless. In a February 1888 puff-piece, the Republican paper gushed, “We have begun to look upon Kroncke’s Park as an almost necessity; in fact it would be difficult to tell what we would do without it”. Finally, in 1890 and after some 700-800 signed a petition demanding the City Council take action (the town population at the time was around 5,000), Kroncke’s liquor license was denied. The end of booze apparently meant the end of the excursions, and likewise the end of the troublemakers. The park didn’t close, but it’s not clear whether it was still open every day. Like the old Arcadia Park, it’s mentioned in the papers as being used for political rallies and rented for group picnics. Even sans alcohol it was a special place. As seen on the fire map below, there was an enclosed bowling alley (they played ten pin, same as today, except with a wooden ball), the large pavilion with a dance floor, and “swimming baths” back by the creek. An ancient oak was surrounded by a stairway and electric lights were strung overhead. The park name reverted to City Gardens after it was sold, and it was sold again in 1897 to the Grace Brothers of local brewery fame. Now it became a beer garden with a concession stand that sold ice cream and a roller-skating rink was added. As “Grace Park” it came closest to being Santa Rosa’s own; Rose Carnival parades usually ended there, Burbank Day celebrations were held, and there were always big doings on Labor Day. There were concerts and children’s carnivals and in 1905 there was a contest where men tried to catch a greased pig. Our story of the place ends with new owners Dr. Joseph Shaw and wife Frances, who started building their extravagant Xanadu-like mansion to house their art treasures. Construction of “Villa Francesca” was abandoned after his death in a 1925 auto accident, but the Shaws and their architectural dreams deserve their own item here, someday, As Luther Burbank’s personal physician and closest friend, the couple’s cremains are buried alongside Burbank. Serious questions remain unanswered about the legacy of Kroncke’s Park: Was it his Sunday excursions which set Santa Rosa skidding towards the ditch? We know by 1905 this was a “wide-open town,” with thriving underground economy from illegal gambling and having the largest red light district between San Francisco and Reno. It seems the park introduced habitual gambling to Santa Rosa. Gambling was always sanctioned at the County Fair racetrack with the newspapers even printing the odds, while the rest of the year saloon keepers could be found to serve as hometown bookies for customers wanting to bet on out-of-town horse races and other events (see “THE MAYOR OF MAIN STREET“). But it’s noteworthy that after Kroncke’s grand opening with the ball and picnic, almost all of his excursion ads promoted some sort of sporting event. Besides sword fighting there was wrestling and sparring, baseball and football games and all kinds of athletic tournaments – just the sort of competitions which attract gamblers. I’ll also argue Kroncke’s excursions could have spurred prostitution here. The subsidized train tickets brought first-time visitors to Santa Rosa who learned it wasn’t a bad daytrip – the ferry/train ride was only about three hours. Still, that was far enough away for scant risk of bumping into the minister or other acquaintances from the Bay Area. But what is certain is the weekly surge of a thousand or so tourists brought in a lot of money – and downtown interests would have been loathe to jeopardize that. Taken together, it exactly fits the pattern of the corruption the muckrakers exposed here in 1905 – with the courts and police willing to look the other way (for the most part), government ignoring public outcry (it took 700-800 signatures, really?) and the newspapers spinning PR instead of calling for reforms. Kroncke’s Park gave us a place which was nice enough that we wanted to ignore it also brought criminals to town. The reunited courthouse square gives us a place nice enough we can try to ignore its design and size makes it most look like a glorified helicopter landing pad. If you squint hard enough you can pretend to see anything you want to see, and Santa Rosa’s pretty good at doing that. 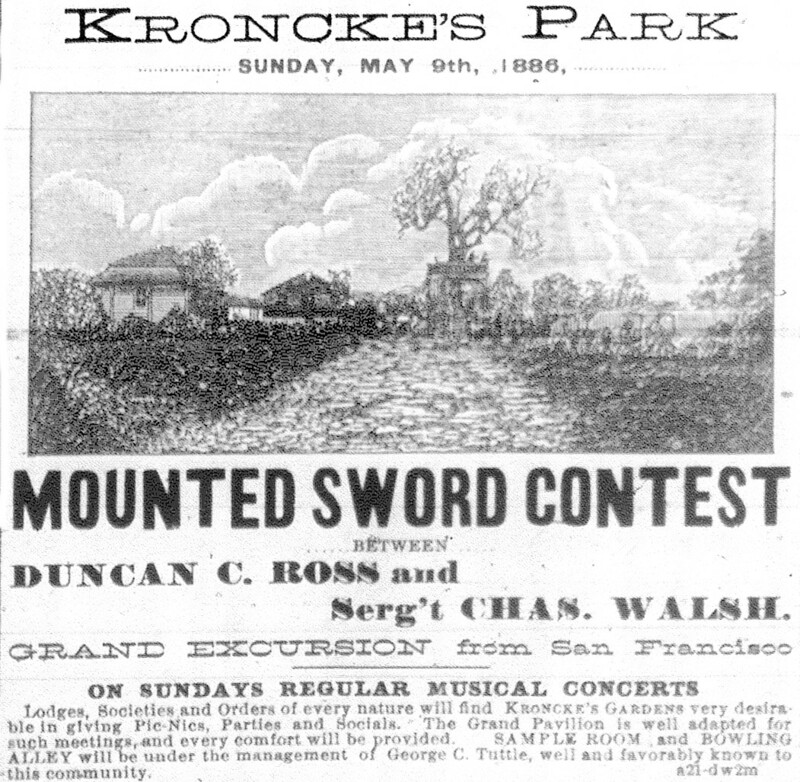 The sword contest between Duncan O. Ross and Sergeant Charles Walsh, at Kroncke’s Gardens Sunday afternoon, attracted a large crowd of people from the surrounding country as well as from San Francisco, which place contributed fourteen coaches full of pleasure seekers. Tbe excursion train from San Rafael arrived about 2 p. m., and found street cars, ’buses and vehicles of all descriptions awaiting to convey the people to the grounds. The contest was one of the most exciting witnessed on this coast. Ross won the match by a score of fifteen to thirteen. At the close of the eighteenth attack the contestants availed themselves of an intermission, which interval was filled by Professor S. J. Reeves giving an exhibition of horsemanship on the back of a wild mustang, which seat he kept notwithstanding the saddle occupied the neck of the animal part of the time. With but few exceptions a good time was enjoyed by all. The exceptions were the loss of money through the agency of pickpockets, but that exception to the pleasures of the day is one that is attendant on all such occasions. Credit is due the enterprising traveling agent of the Donahue road, Mr. T. C. Wills, for his successful efforts in behalf of our little city. The excursion to this city and Kroncke’s Park Sunday, was made up chiefly of hoodlums, although there were many respectable people; and it is due them to say they took no part with the other and rougher portion of the crowd. It is well that the excursion Sunday is to be the last of the season, for our citizens have got enough of such visitors as have come here on one or two occasions of similar character this summer, and are about ready to organize a remonstrance committee. It should not be inferred that all the excursions have been objectionable; many of them have been composed of laboring men and their families, who came here to spend a quiet Sunday away from the noise and bustle of the great city. But the majority of the excursionists last Sunday were of a class contaminating in their mere presence. Their conduct while here was such as to keep our officers busy all the time preserving the peace. The women were equally as bad as the men, and incited their escorts to ribald actions. At 3 o’clock in the afternoon a general fight ensued at tbe gardens, and it was with much difficulty that the officers finally restored peace. One of the roughs was taken in custody and brought before Justice Brown, who fined him $7, and let him go. The Marshal arrested another “tough” on Fourth street soon after the arrival of the train, and experienced much trouble in getting him to jail. At the corner, by the Hall of Records, he showed fight, and had to be knocked senseless with a club before the balance of the distance was completed. Several personal fights ensued at the park during the afternoon, but no further arrests were made. When the train left for San Francisco in the evening about sixty of the hoodlums got left, and put in the night parading the streets. M. Byrne, proprietor of Byrne’s Hotel, opposite the depot, was assaulted by an unknown party Sunday evening in the reading and bar-room of his hotel. Samuel Stoner, an eye-witness to the assault, related the following particulars to a Republican reporter who arrived on the spot shortly after the deed was done: “The assailant stepped behind the bar-counter, picked up the dinner bell and commenced to ring it. Mr. Byrne asked him to quit ringing the bell. The man still presisted in his annoyance when Mr. Byrne started toward him uttering an unpleasant epithet. The assaulting party then struck Mr. Byrne on the head with the bell and ran out saying he did not allow any one to abuse him. As soon as stuck Mr. Byrne fell senseless to the floor and those present ran to his rescue. The fleeing man made good his escape.” It is thought he was an excursionist and left on the train which pulled out for San Francisco soon after the affair took place. The police officer searched the train in company with a witness to the scene but did not succeed in identifying the man. Deputy Sheriff L. Brietenbach and a witness boarded the 5 o’clock excursion train for the city with the hope of apprehending the assailant. Chief of Police Crowly, of San Francisco, was telephoned a description of the man. The offender is a young man with auburn hair and at the time deed was committed was in his shirt sleeves. A woman was instrumental in hiding him away. It is supposed he was intoxicated. Drs. Davis and Shearer were summoned immediately after the occurence and administered to the sufferer. Mr. Byrne, although unconscious for some time, is not necessarily injured fatally. He was struck in the back of the head. While there was undoubtedly a large number of respectable people among the excursionists, the major part was composed of the usual gang of San Francisco toughs, accompanied by their customary companions–first-class candidates for the Magdalen Asylum. The arrival of the train in this city was the signal for an unrestrained outbreak of that spirit which the tough is prevented from indulging freely at home on account of the vigilance of the metropolitan police force. This element, during their passage from the depot to the Park, took occasion to render themselves obnoxious to the respectable people with whom they came in contact. Ladies were insulted and a number of our citizens were crowded off the sidewalks. The conversation with which the sallow-faced individuals. dressed in chinchilla coats, entertained their vulgar female companions was an outrage on all sense of decency. During their stay it required the utmost vigilance of the officers to keep them within bounds. One of the toughs, who was arrested under the name of Tim Hallihan, entered Byrne’s Hotel, Sunday afternoon, shortly before the departure of the train, and perpetrated an outrage which is likely to be revenged with the full penalty of the law. The tough walked behind the bar, announcing his attention of taking the establishment and commenced ringing the dinner bell violently, as if to demonstrate his ability and willingness to verify his words. Mr. Byrne’s requested him to desist. His words had no other effect than to increase the volume of sound. He started towards the obstreperous individual as if to take the bell from his hands, whereupon he was felled to the floor unconscious, by a heavy blow under the left ear from the bell. The large crowd which had gathered immediately rushed to Mr. Byrne’s assistance, which gave his assailant an opportunity to escape. He was not backward in improving it, and disappeared among the crowd which was just then swarming around the cars. A gentleman who had witnessed the occurence pointed the man out to Deputy Sheriff Breitenbach, who followed him on to the train. In the bustle and confusion the escaping tough concealed his identity and was not captured until the train was nearing Miller’s Station. Trouble with the friends of the prisoner was anticipated, and the conductor of the train, Frank Grace, and two San Francisco policemen who were on the train came to the arresting officer’s assistance. True to their loyalty, the toughs arose from their seats as if by one impulse and made a dash for the prisoner’s liberation. No blows were exchanged. The toughs depended on their numerical strength, but were unsuccessful. The prisoner was brought to this city on the evening train and changes filed against him for assault with a deadly weapon. Justice Brown, before whom he was taken Monday morning, held him to bail at $500. It is understood that several of the saloons in this city were robbed in a bold manner. It is stated that while the train was at the depot in Petaluma a number of the excursionists weht into a saloon close at hand and robbed the proprietor of several bottles of liquor and boxes of cigars in a high-handed manner. From Mr. Henry Kroncke a Republican reporter learned that he was making extensive improvements in the park, preparatory for the coming season. This delightful place of resort became quiet famous last season, and as a result Mr. Kroncke states that every Sunday in April, May and June have already been engaged, and Mr. Kroncke’s agent in San Francisco informs him that there will be no difficulty in securing picnics during the season up to August 1st. The park has been rented only to social clubs and societies, and Mr. Kroncke has exercised the greatest care in making contracts, as he can assure us that only the most respectable societies will be permitted to hold picnics at the park. The bowling alley will be fixed up again with several improvements. An outside bar will also be arranged for picnics. The swimming baths, will be in operation and conducted upon the same thorough and strict system as last year. These baths are one of the most attractive features of the park and arranged probably better than any of a similar character in the State. They are something that Santa Rosa has been in need of for some time, and the liberal patronage justifies Mr. Kroncke in continuing them. The work of improving the grounds has already commenced and the green grass, shady trees and blooming flowers will be a great attraction for Santa Rosans during the warm days and evening of summer. We have begun to look upon Kroncke’s Park as an almost necessity; in fact it would be difficult to tell what we would do without it. The construction of the park and its success, has been one cause of Mr. Kroncke being placed in the lead of enterprising citizens of Santa Rosa. …[I]t is the duty of this committee to ascertain the effect of establishing such a business in the locality described in the petition and ascertain whether or not it would be to the detriment of any other individual. We find no evidence that it would not, while we do find that within the last twelve months a protest of some seven or eight hundred names was filed with your clerk protesting against the licensing of a bar or drinking saloon in the premises described in the petition. Our own Superior Court has interpreted the spirit of article 2 of the ordinance to be the confinement of the liquor traffic to the central or business portion of the city, as a police regulation. If so, we should not ourselves break the law. The committee recommended that the petition be denied…The report was adopted by a unanimous vote of the council. The property former known as Kroncke’s Park, now the City Gardens, was sold on Saturday to Grace Brothers, who will fit up the residence and the garden as a pleasure resort and park. The grounds are attractive and the location central. The property has been owned for some time by Joseph Kohnenberger, and the sale was consummated through the real estate agency of Davis & Farnham. It is expected that very extensive improvements will be made by the new owners.